Meet the the intrepid crew of the USS Those Guys. Don’t worry we aren’t nearly so calm in real life. We work hard and have a good time doing it! 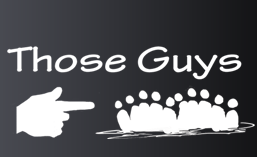 Howdy everyone my name is Keith Leiker, and I’m the producer for DigiPen’s “Those Guys”. We have an extra long post today because we’ve been gone for the last month and lots has happened! I would like to welcome Anne Feeny, David Scamehorn, and Adam Purvis to the team. The scope of the game is such that we need more hands on deck and they will be instrumental to completing the game to the level that we want. Those Guys are one of the six teams selected to participate in a pilot program that will see us trying to do some scholarship fundraising! We are super excited and will send out more details soon about how you can help support us and the other five teams. However that means that we will be more strict with the content we gve out. Weekly blog posts will come to all, and we will keep putting up art nuggets, but the Alpha and Beta builds may not be available. Stay tuned for more on this. We have a new team space! DigiPen has finally put together a floor plan so teams can have some official space. We have a nice corner of the new 3rd floor computer lab, named Tesla the best real world mad scientist ever! My job as the teams producer is to make sure everyone has what they need to succeed at building their part of the game. That means planning meetings to discuss design, animation, and programming. I define what goals we will strive to hit for milestones, and keep track at a high level the progress of the team. After a quiet winter break we have been running really hard as a team to accomplish a ton of stuff. We split up the fourteen weeks of spring semester into seven, two week sprints, to help us keep our noses to the grindstone. We are currently running toward our Alpha milestone, where we need to have all of our mechanics finalized, a grey box of our entire game complete, and some significant rework of the art assets that populate the game. I am happy to be working at getting our new team members on-boarded and hope to t be able to show some excellent artwork and more audio soon. We have quite a few new mechanics that we are trying to get in, and Jonathan and David are busy getting a new player controller working with these new mechanics. Anne has been busy re-skinning our main character “That Guy” and building some fresh animations. Brandon and David have been discussing all of the story beats and level flow along with Jonathan, we should have some significant progress soon! Adrian, and Hans have been working on getting us some new AI behaviors for our “NPC” and building some excellent visual tech to make the game pop. Hojun, Decker, and Adam have been hard at work refocusing on what needs to be rebuilt and what else we will need. It’s an exciting time for us, there’s lots of possibilities that we are sanding off to get the game ready for milestone though.